Continuing on with our series on the Governors of Illinois, we come to William Henry Bissell, the eleventh governor of Illinois, and the first Republican governor. Bissell was born on April 25, 1811 near the town of Painted Post in New York. Studying medicine, he opened a practice in Monroe County in Illinois. Eventually at the age of 30 he shifted careers from medicine to the law. In 1840 he was elected to the state legislature as a Democrat. Passing the bar he was appointed by the legislature as prosecuting attorney for the judicial circuit in which he lived. After the War he was elected as a Democrat to Congress. He was an ardent foe of the Kansas-Nebraska Act and became identified with the new Republican party. In 1850 he almost fought a duel with Jefferson Davis. Bissell had defended the courage of Northern troops who fought at Buena Vista and accused Southerners of attempting to hog the glory of that day. Davis, who had commanded the Mississippi Rifles at Buena Vista, thereupon challenged him to a duel. Bissell, who never lacked courage, accepted and designated the weapons for the duel as army muskets loaded with balls and buckshot. 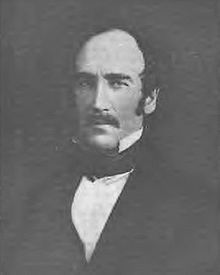 President Taylor, the former father-in-law of Davis threatened Davis with arrest, and a peaceful resolution was reached between Bissell and Davis. In his third term in Congress Bissell was stricken with paralysis and walked with crutches for the rest of his days. The 1856 convention of the Democrat party strongly endorsed the Kansas-Nebraska Act and effectively drove Bissell and other anti-Kansas-Nebraska Act Democrats out of the party. Although his health was failing, Bissell accepted the nomination of the new Republican party as the first Republican candidate for governor in Illinois, and won the office by 4,729 votes in November. During his term in office, a railroad connection between the Mississippi River and the Eastern seaboard was completed in Illinois, and the Illinois legislature was reapportioned to better reflect population distribution in the State. Bissell spent most of his term as an invalid battling the paralysis that progressively robbed him of strength. He died on March 18, 1860, at age 49 of pneumonia, the first Illinois governor to die in office. Prior to his death he received the last rites of the Catholic Church, having converted to the Faith in 1854 after marrying his second wife, his first wife having died, who was a Catholic. Bissell thus was the first Catholic governor of Illinois, the first Republican governor of Illinois and the first Illinois governor to die in office.